The 'Yellow Book Series' is produced by 'West Country Community Newspapers Ltd', part of 'Tindle Newspapers Ltd' which is a privately owned company dedicated to producing newspapers and other forms of media at the very heart of the local communities. Crediton, Venny Tedburn, Uton, Hookway, Sandford, Cheriton Fitzpaine, Upham, Black Dog, Thelbridge Barton, Copplestone, Bow, Eastleigh, Lapford, Morchard Bishop, Down St Mary, Colebrook, Hillerton, Spreyton, Lords Meadow Industrial Estate, Little Silver, Efford, Cadbury, Upexe, Thorverton, Brampford Speke, Newton St Cyres, Upton Pyne, Cowley, Whitestone, Tedburn St Mary, Cheriton Bishop, Drewsteignton. See the maps page. 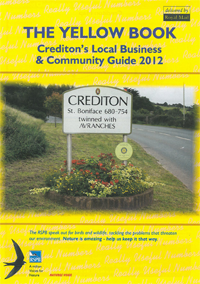 The Yellow Book for Crediton is a very popular local directory specifically for Crediton and it's surrounding area which has been produced from our office in Axminster for several years now. Each edition is published annually as an A5 glossy directory which is delivered door to door via Royal Mail. Nearly 15,000 copies are distributed to every single home and business throughout crediton area to all the places listed. The Yellow Book offers the opportunity for everyone to see exactly what's right on their doorstep and in doing so helps to keep the wheels of the local economy turning. Dimensions of display advertisements online reflect the dimensions of the print versions. As with the printed advertisements, the more words advertisers choose to put in their advertisements, the smaller the print has to be in the given size, and this (obviously) may affect clarity and legibility. The importance of maintaining fast download speeds for images, especially in areas where there is still limited availability and take-up of broadband, has necessitated the selection of smaller file sizes. This may mean a very slight loss of clarity is also unavoidable in some cases, but there is no point in selecting brilliant image quality if as a result customers can't be bothered to wait for them to appear on screen. Yellow Book is a once-a-year publication, and that will also apply to the online version. The Yellow Book website will be posted online annually, to coincide with the print version, ongoing additions or amendments may be available. Please send any communications regarding advertising on this site, booking etc, to [email protected].